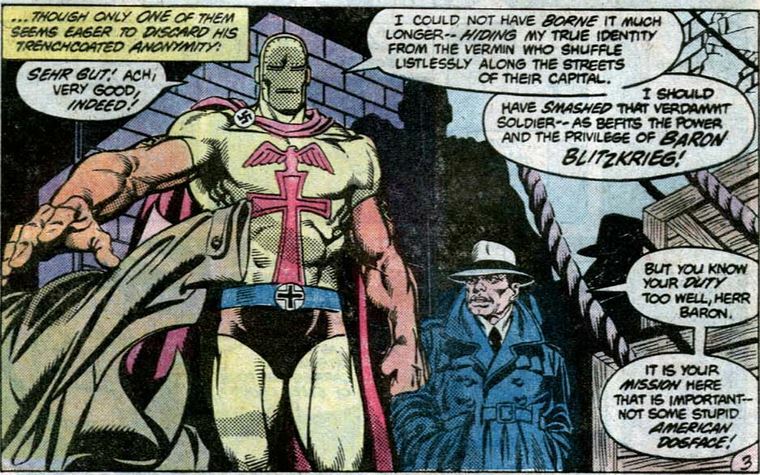 We are introduced to the German "mystery man" Baron Blitzkrieg. He's not in Germany though, he's in the U.S., most likely up to some mischief. He and his cohorts are planning the assassination of Winston Churchill and Franklin Roosevelt during a supposedly secret meeting between the two men on American soil. In truth no such meeting ever came to pass - certainly not during this part of the war when Germany was still winning - a trans-Atlantic journey with the Prime Ministe would simply be too risky no matter how secret. 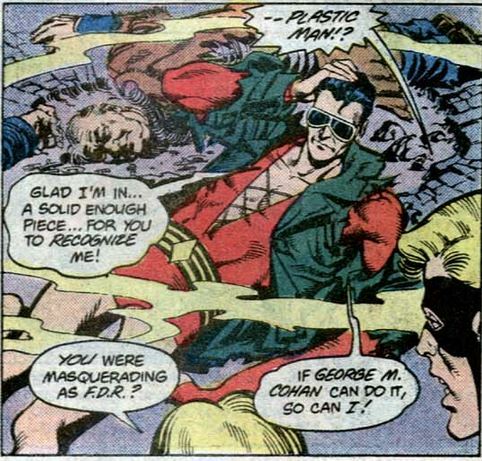 Speaking of security breaches, the Atom manages to circumvent the White House's defenses to pay FDR a late night visit. 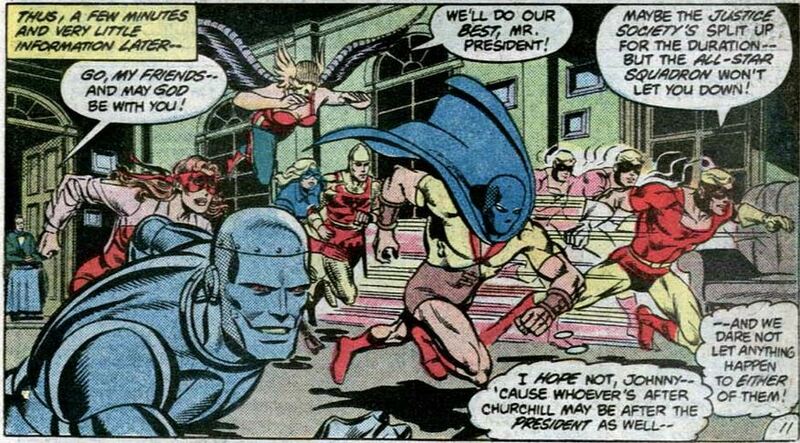 The President recalls the time the Atom saved his life . . .
. . . and the time he suggested the formation of the JSA. 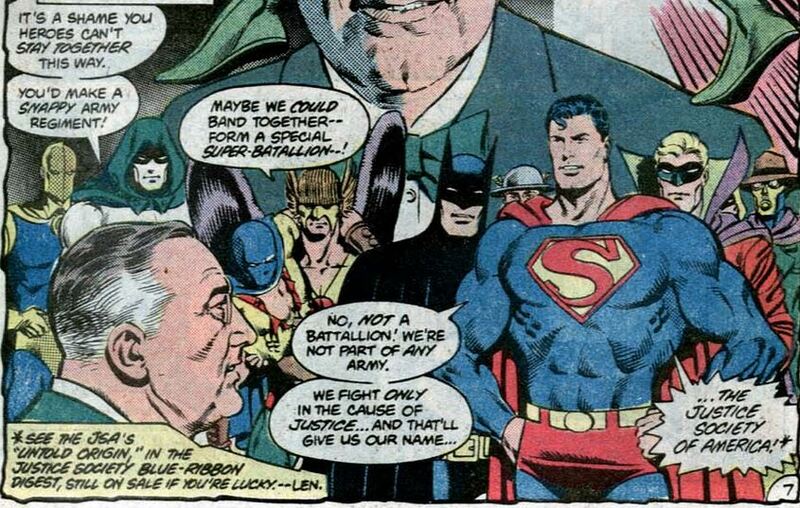 It was also FDR who suggested the creation of the All-Star Squadron. 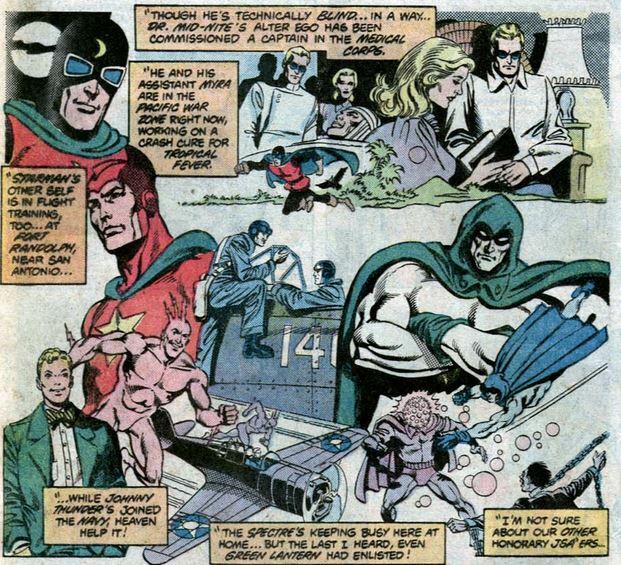 We get a capsule explanation of the activities of the disbanded JSA. 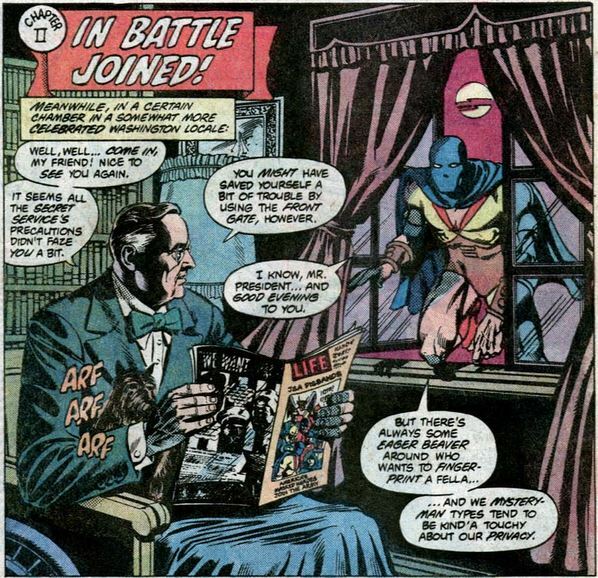 FDR surprises the Atom by revealing that the rest of the active All-Star Squadron is in the White House. FDR informs the All-Stars that Churchill will be arriving and there is a plot against the Prime Minister. The Squadron has been tasked to protect the British leader. 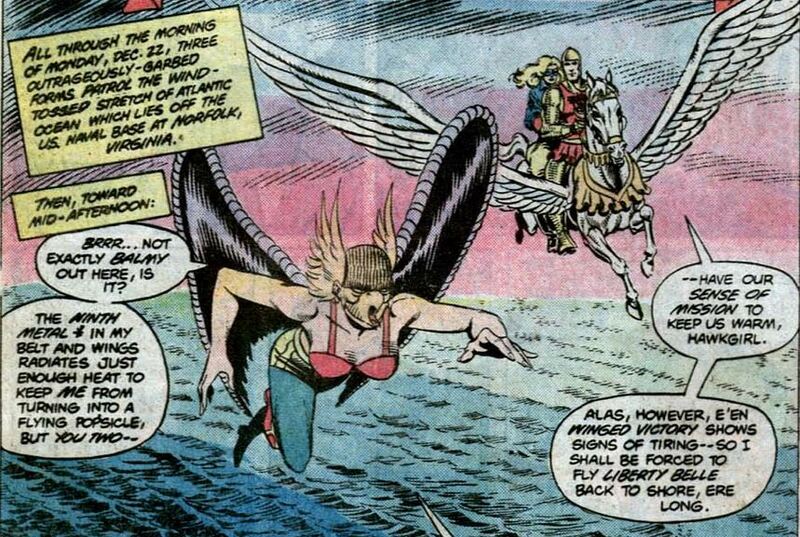 The Shining Knight, Hawkgirl and - strangely - the non-flier Liberty Belle, patrol the Atlantic skies. 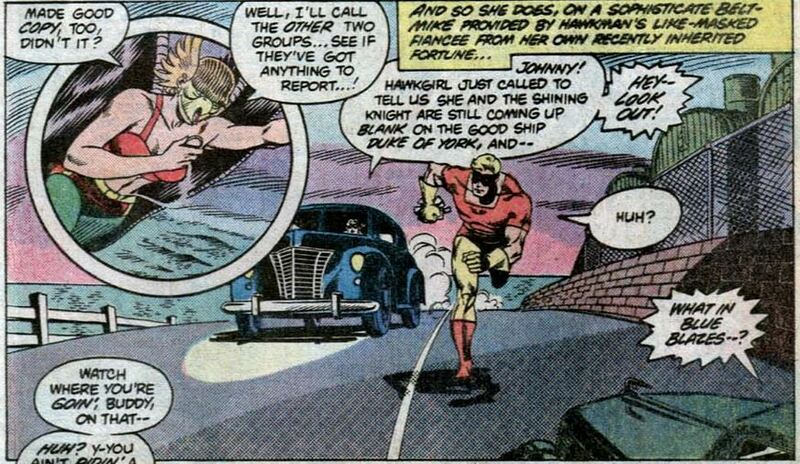 Firebrand (in the car) and Johnny Quick are on ground patrol. 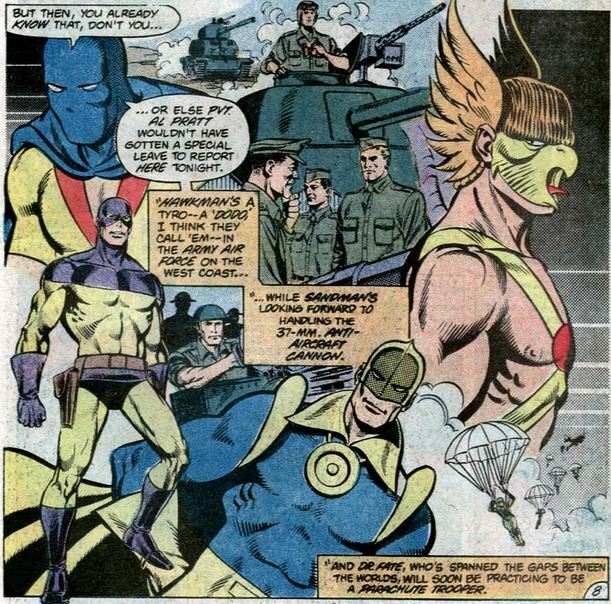 On guard duty are Atom and Robotman. 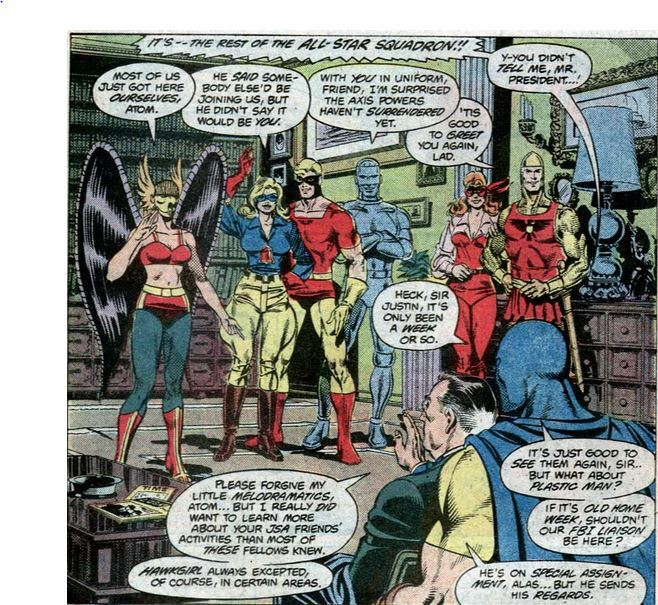 That's right Atom, you've got a - you know, something that Robotman is surely missing. 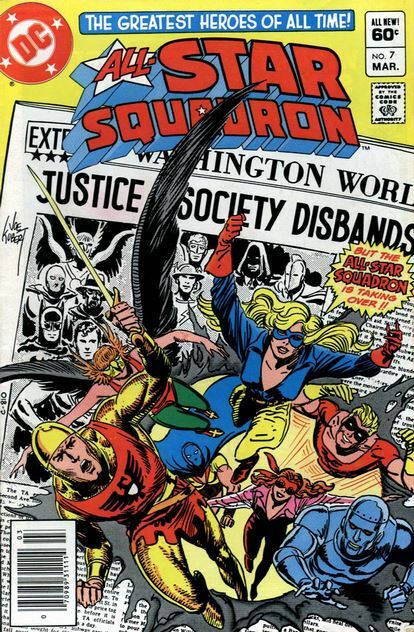 Getting back to the Churchill job, the Nazis manage to get pass the All-Star Squadron as the H.M.S. York, carrying Winston Churchill, is bombed. 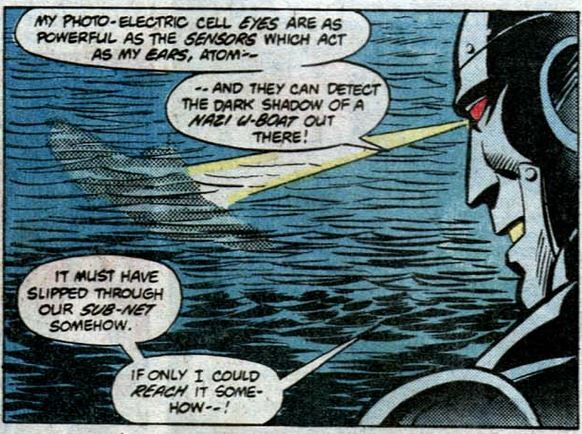 Robotman reveals an ability that allows him to see a Submarine under water. 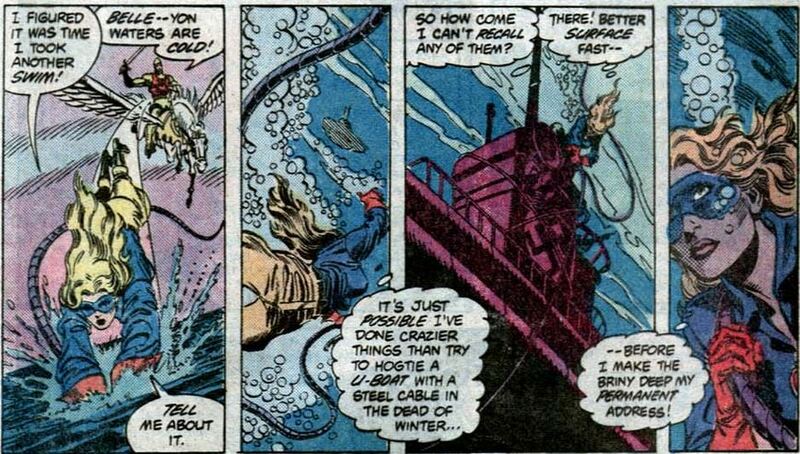 The airborne All-Stars spot a U-boat and Liberty Belle heroically wraps a steel cable around its conning tower. 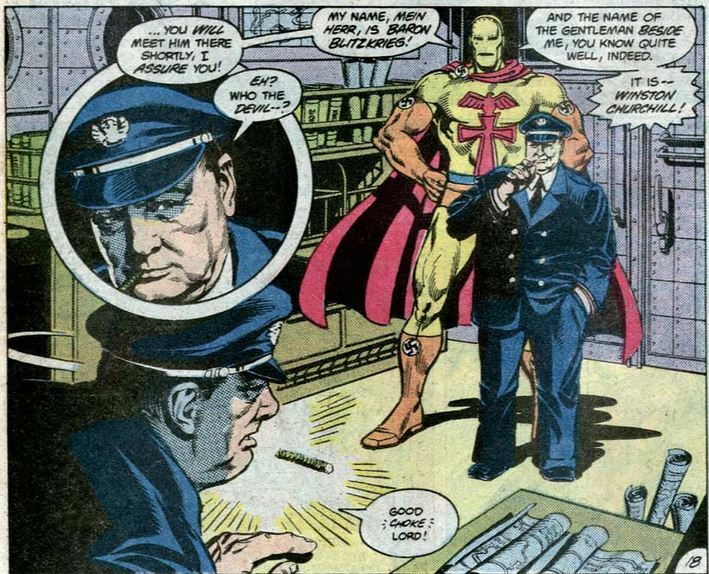 Meanwhile, inside the British destroyer Captain Blitzkrieg confronts Winston Chuchill with his doppelganger. 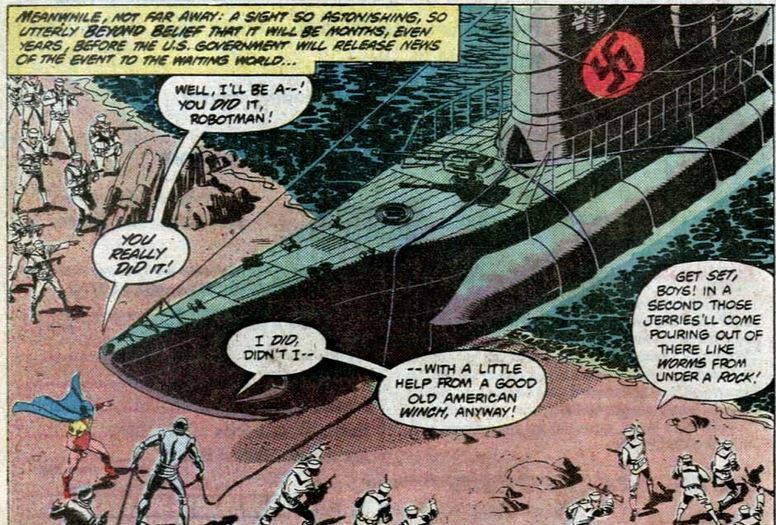 Back outside, an entire U-boat has been hauled on shore, primarily through the strength of Robotman. 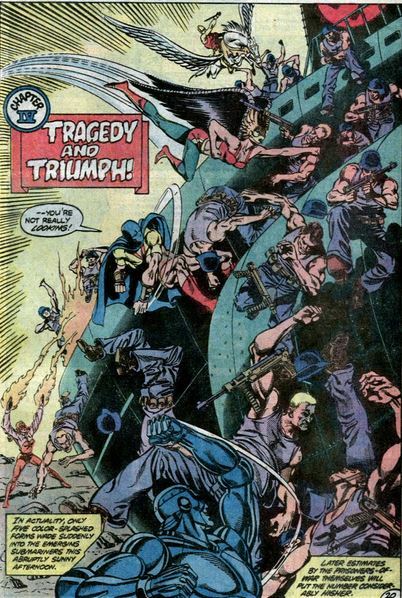 When the crew clambers out the All-Star Squadron launches into action. What a fierce crew. i would think that upon realization that their entire sub has been hauled out of the water, these guys would surely be going on shore with their hands up. 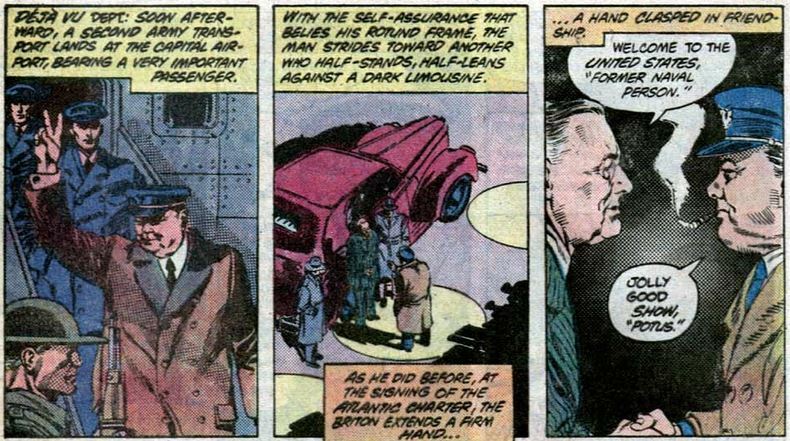 With a Nazi robot taking Churchill's place, the meeting occurs and the bomb goes off! Fortunately, it wasn't the real FDR either. 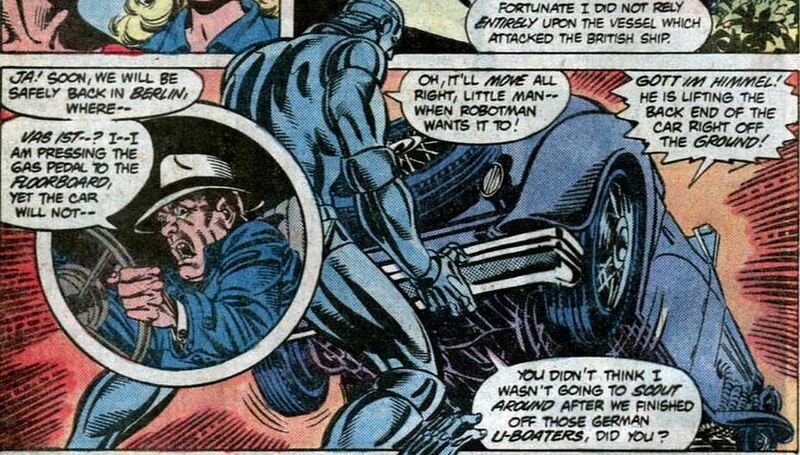 The real Churchill is to be squirreled away by car by Baron Blitzkrieg. 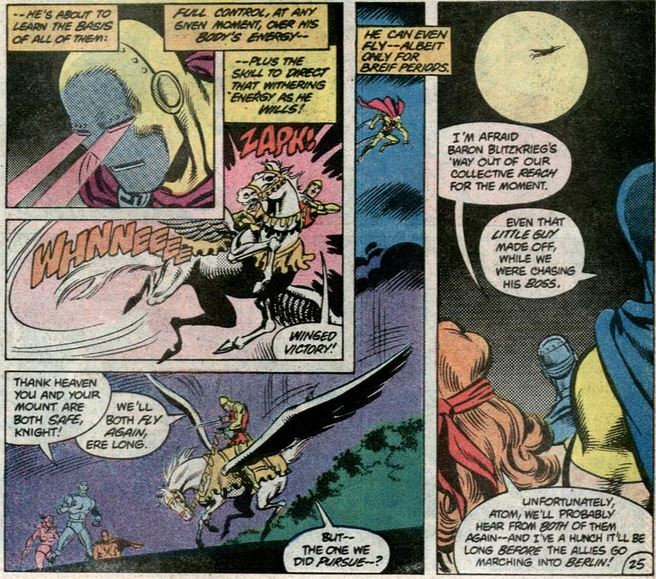 Fortunately Robotman is on to the kidnapping. 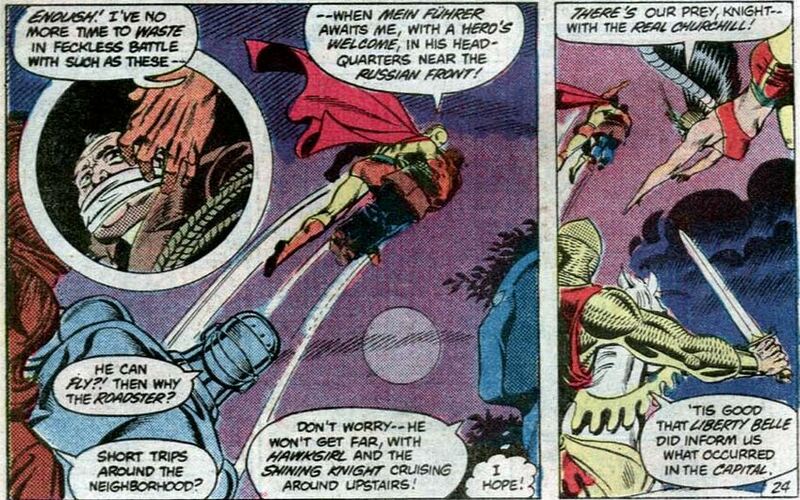 It's Robotman vs. Baron Blitzkrieg. The Baron takes to the air but he is pursued. 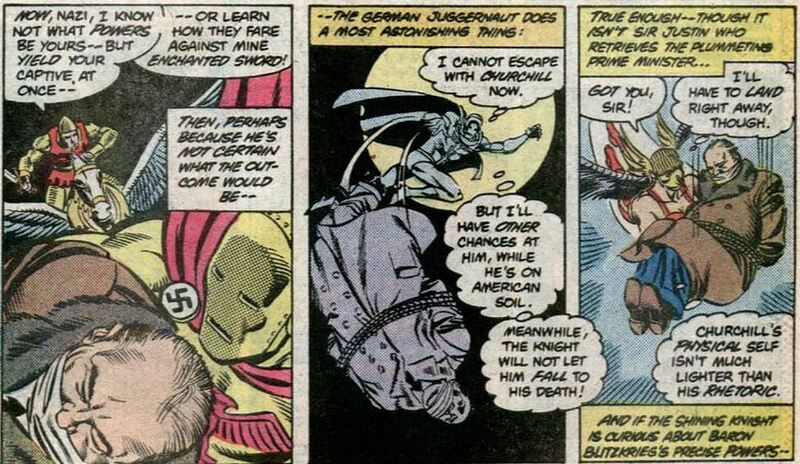 Blitzkrieg drops Churchill . . .
. . . and manages to strike the Shining Knight before mounting an escape. The real meeting occurs with no incident. 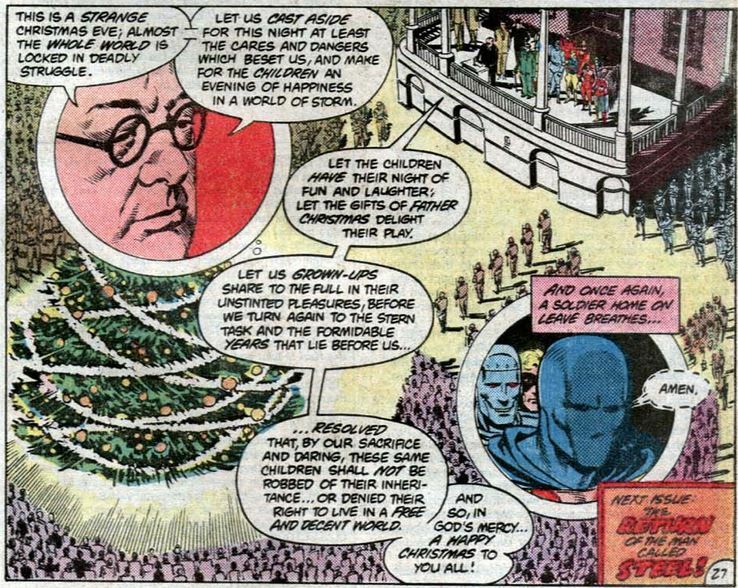 Christmas is spent at the White House as Roy Thomas gives Churchill a speech that would have done the real Churchill proud.